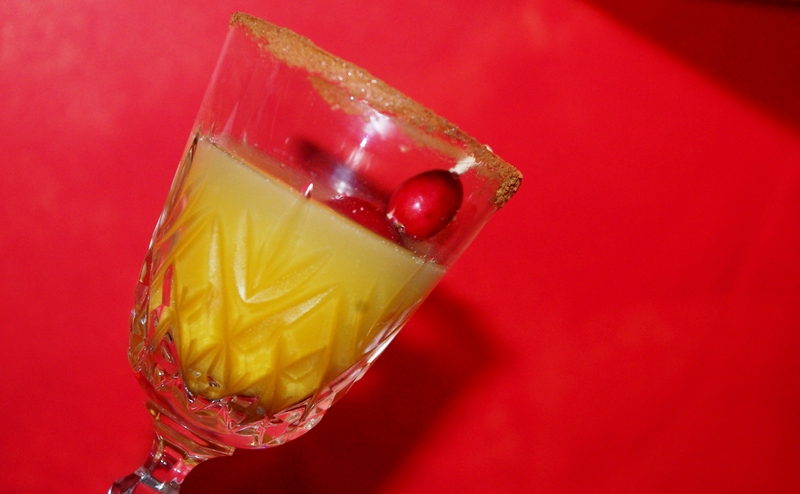 A cocktail that captures the flavors of pumpkin pie in light and potable form. Stir pumpkin purée into rum until smooth. Add optional Kaffir lime leaf. Shake with remaining ingredients in cocktail shaker with ice. Strain into cordial glasses. Garnish with cranberries and/or candied ginger. For an extra special presentation, rim glasses with cinnamon and sugar. Mix cinnamon and sugar to taste. Dip glasses into lemon juice and then cinnamon-sugar mix. Use a match to flame and crystalize sugar for final finish.